254 pages | 14 B/W Illus. Demonstrating how a university can, in a very practical and pragmatic way, be re-envisioned through a transdisciplinary informed frame, this book shows how through an open and collegiate spirit of inquiry the most pressing and multifaceted issue of contemporary societal (un)sustainability can be addressed and understood in a way that transcends narrow disciplinary work. It also provides a practical exemplar of how far more meaningful deliberation, understandings and options for action in relation to contemporary sustainability-related crises can emerge than could otherwise be achieved. Indeed it helps demonstrate how only through a transdisciplinary ethos and approach can real progress be achieved. The fact that this can be done in parallel to (or perhaps underneath) the day-to-day business of the university serves to highlight how even micro seed initiatives can further the process of breaking down silos and reuniting C.P. Snow’s ‘two cultures’ after some four centuries of the relentless project of modernity. 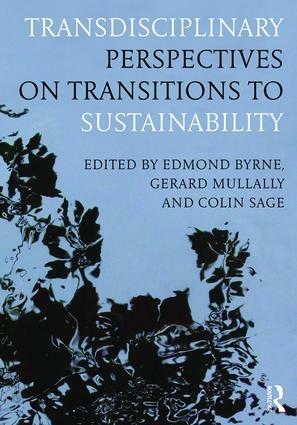 While much has been written and talked about with respect to both sustainability and transdisciplinarity, this book offers a pragmatic example which hopefully will signpost the ways others can, will and indeed must follow in our common quest for real progress. Dr Edmond Byrne is Senior Lecturer in Process & Chemical Engineering at University College Cork, Ireland. Dr Gerard Mullally is Lecturer in the Department of Sociology at University College Cork, Ireland. Dr Colin Sage is Senior Lecturer in Geography at University College Cork, Ireland. All three are lead collaborators on the ‘Sustainability in Society’ transdisciplinary research group at University College Cork, Ireland.